Trust A/C Contractors with all of your comfort needs — we offer reliable and responsive heating repair services for homeowners throughout the Longview and Tyler, TX areas. We’ve been the leading residential heating repair specialists for local residents for over 25 years, and our widely experienced and certified technicians provide quality, effective heating services for all heating types, makes and models including furnaces and heat pump repair and system upgrades. With all of our services, we guarantee customer satisfaction along with lasting system performance, efficiency and superior indoor comfort. We also offer free service estimates, workmanship and product guarantees and emergency 24-hour repairs. During the chilly winter season, don’t be caught without proper heating solutions for your home — heaters are manufactured to provide up to 20 years of reliable heat, but with daily use and irregular system maintenance, it’s common for local homeowners to experience malfunctions. By trusting our trained and certified heating specialists for your repair needs, you’ll have lasting results — all repairs are completed using the highest quality parts and equipment to ensure performance. Have you noticed that your furnace or heat pump isn’t functioning as smoothly and efficiently as it once did? While your heating system was designed to perform reliably for many years, over time, you may notice that your heating system performs irregularly or needs frequent repairs. Increased Heating Costs: If your monthly heating costs are steadily increasing over time, then your furnace is likely working too hard to keep your home comfortable and driving up your energy expenses. By contacting your local heating repair specialists, you can determine the cause of your system’s inefficiencies and explore your heating replacement options. Frequent Repairs: When your furnace is operating, do you notice strange noises coming from the unit or experience frequent problems? If you’re regularly calling your local heating repair specialist to perform repairs or if the expenses are costing more than what the heating system is worth, then you may benefit from having the system replaced. Uneven Heating: As you enter different rooms of your home, do you notice some rooms are cooler than others? If so, then your heating system isn’t operating efficiently, and a replacement may be the best solution. 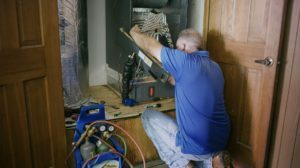 At A/C Contractors, we provide quality heating repair services for homeowners throughout the Longview and Tyler, TX areas. We have more than 25 years of experience working with local residents and are dedicated to offering personalized, affordable and dependable service. Schedule your heating repairs or request a free service estimate today by filling out our online form or calling 866-427-7689.